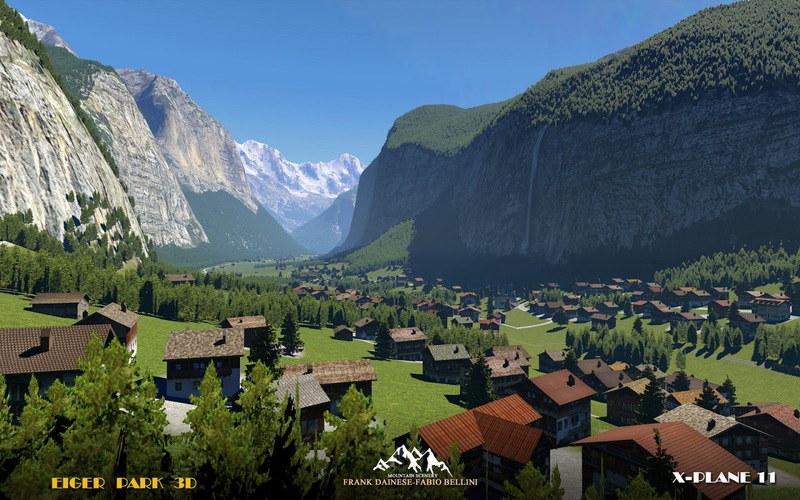 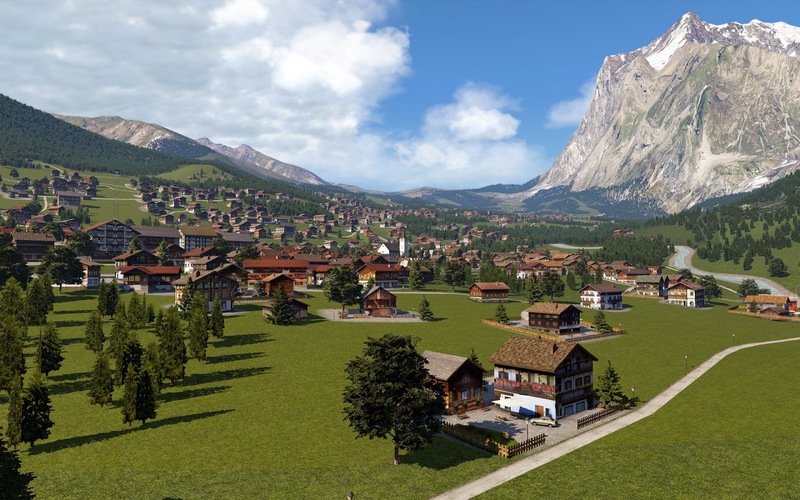 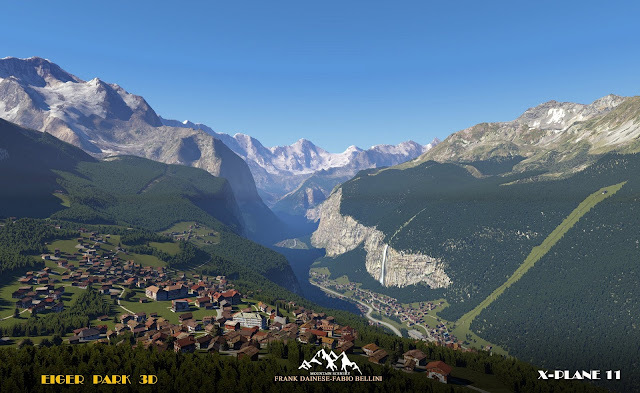 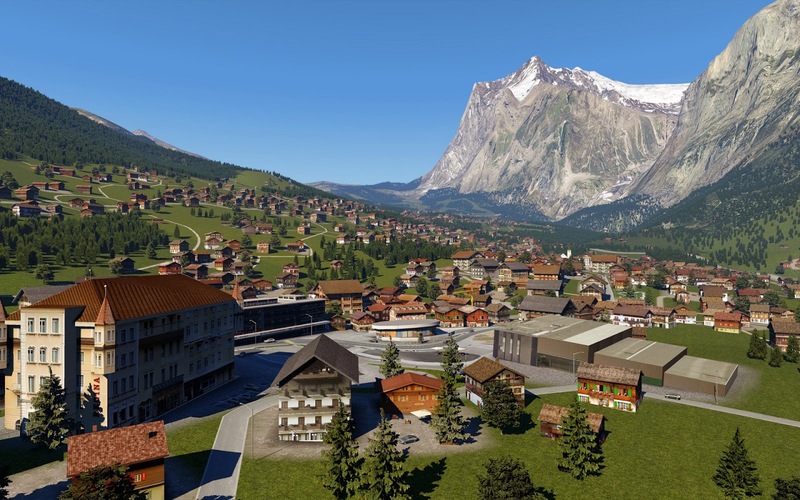 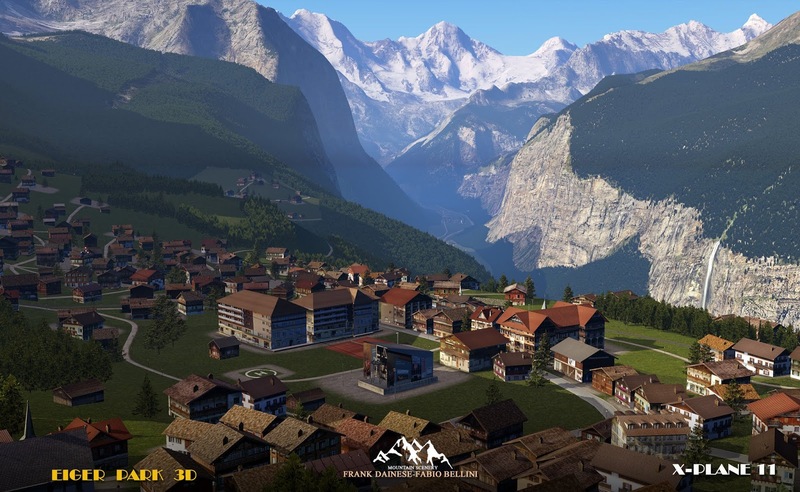 Other locations in " Eiger park " scenery: Lauterbrunnen and waterfall, Stechelberg, Gimmewald, Murren. 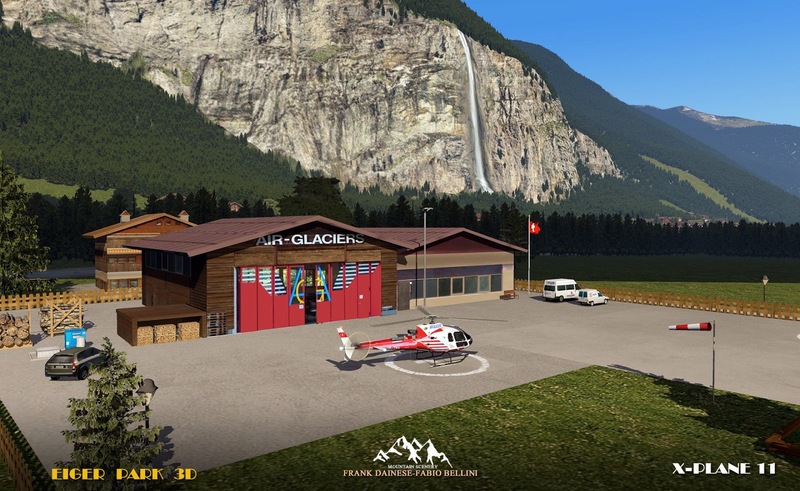 Heliport : Air Glaciers base (LSXL) and Swiss Helicopter (LSXG) in Gstiewiller (Interlaken). Da alcuni giorni sono cominciati i test dello scenario "EIGER 3D park". 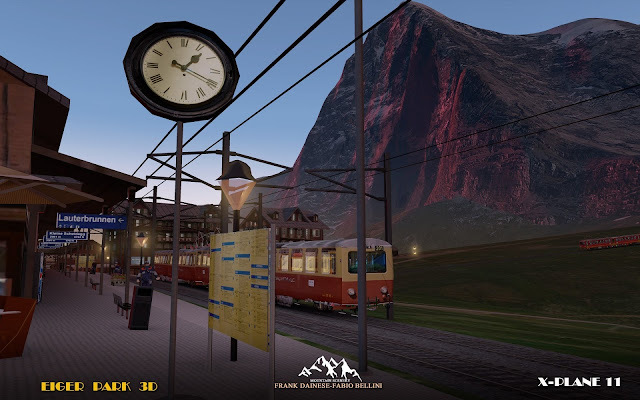 Prevedo ancora fino alla fine di aprile, poi le correzioni e modifiche. 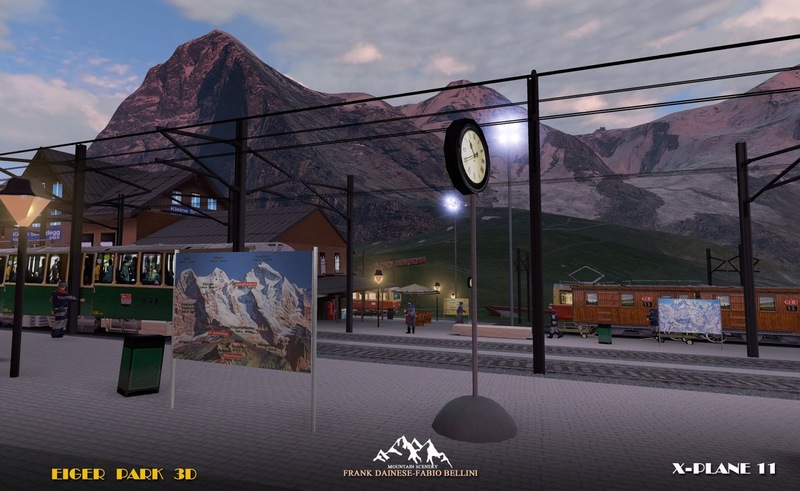 The tests of "EIGER 3D park" scenery have been underway for several days. 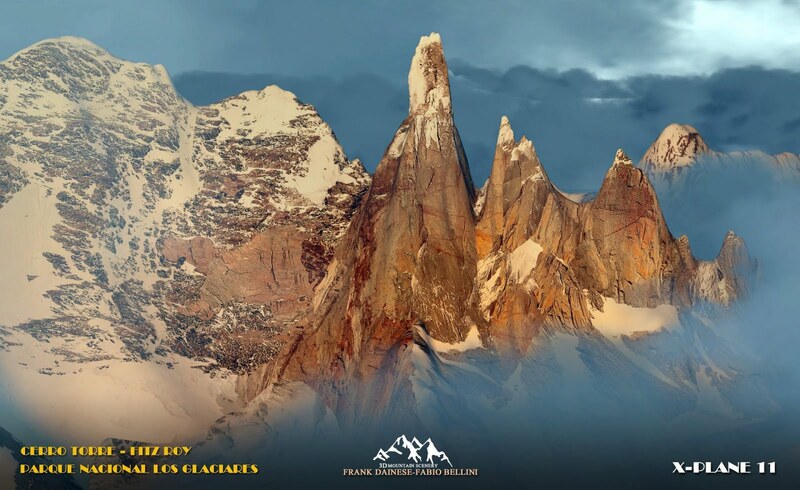 I still foresee until end of April, then corrections and changes. 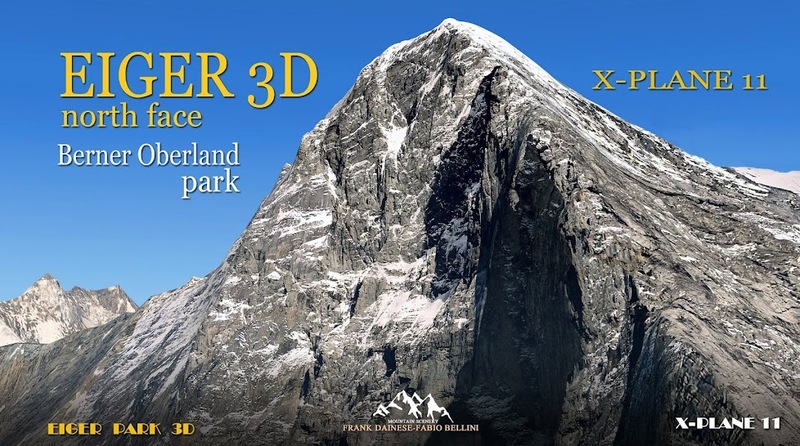 Abbiamo terminato la prima fase, tutti gli oggetti 3D ricostruiti e posizionati. 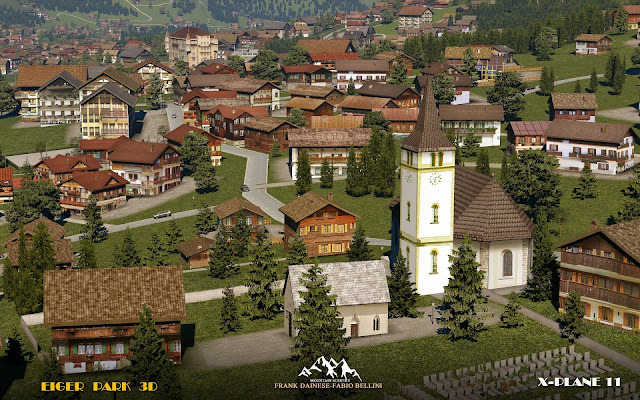 Oltre 4000 edifici con tipologia tipica e oltre 70 modelli 3D.Le Mesh definitive per il 90%. Ora, inizia la fase di correzione. 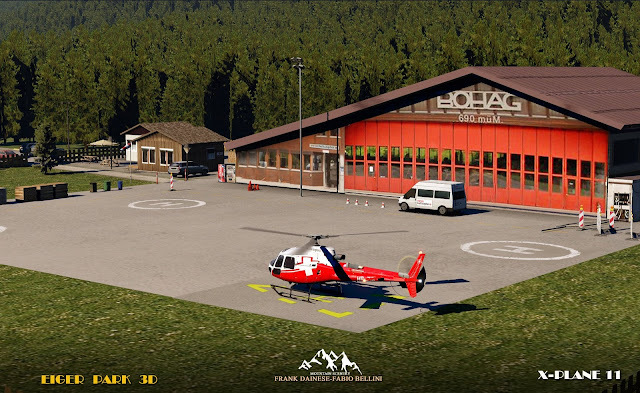 Lo scenario di circa 500 kmq. comprenderà una aviosuperficie in erba di Grindelwald e 9 Eliporti, disolocati nelle varie località turistiche. 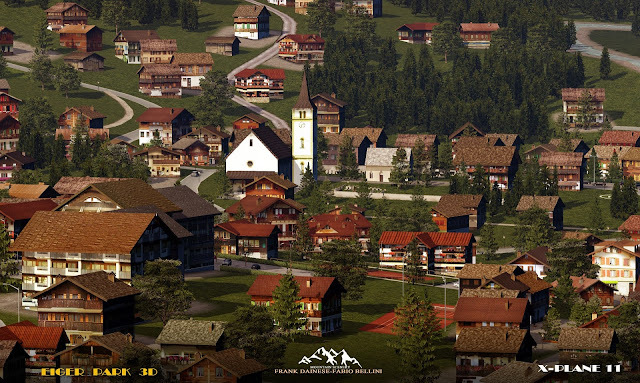 Sono state riprodotte 13 impianti di risalita (funivie/seggiovie). 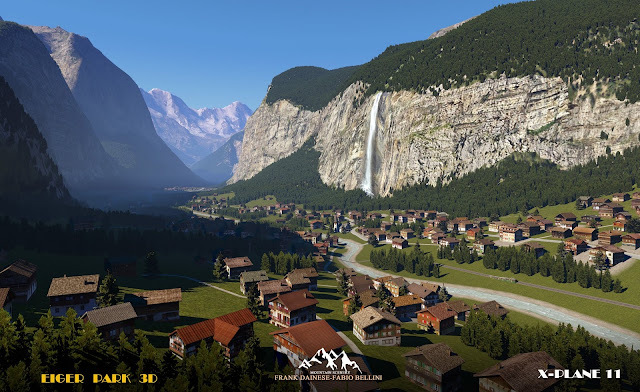 Oltre a Grindelwald, ricostruite Wengen, Lauterbrunnen con la famosa cascata di oltre 400 mt., Stechelberg, Murren e la sua cascata, Gimmelwald. 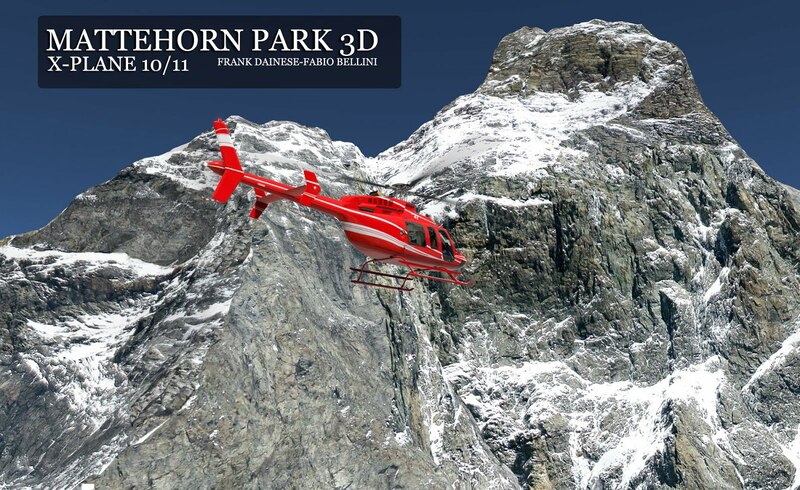 We finished the first phase, all 3D objects rebuilding and positioned. Over 4000 buildings with typical typology with over 70 3D models. The definitive Mesh for 90%. 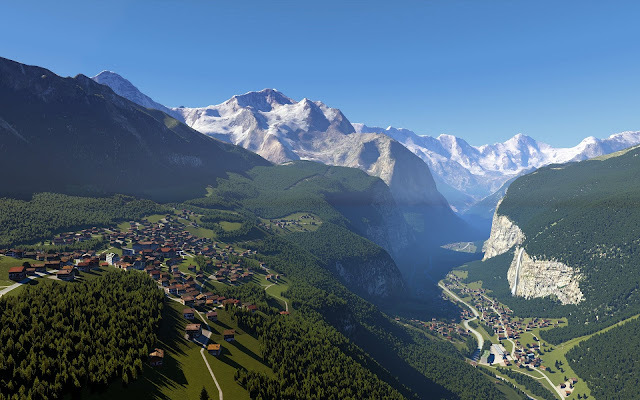 Now, the correction phase begins. 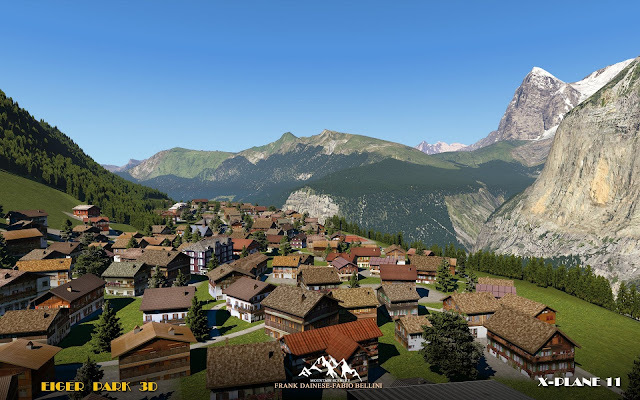 The scenery of about 500 sq. Km. 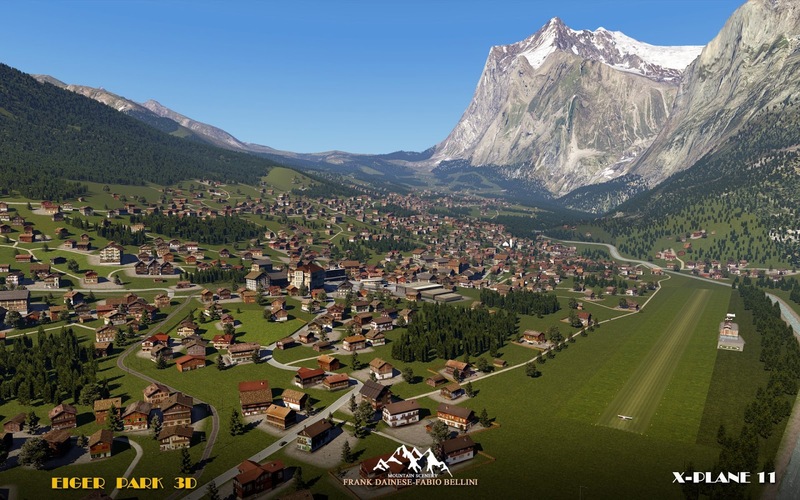 it will include a grass airfield of Grindelwald and 9 Heliports, dislocated in the various tourist resorts. 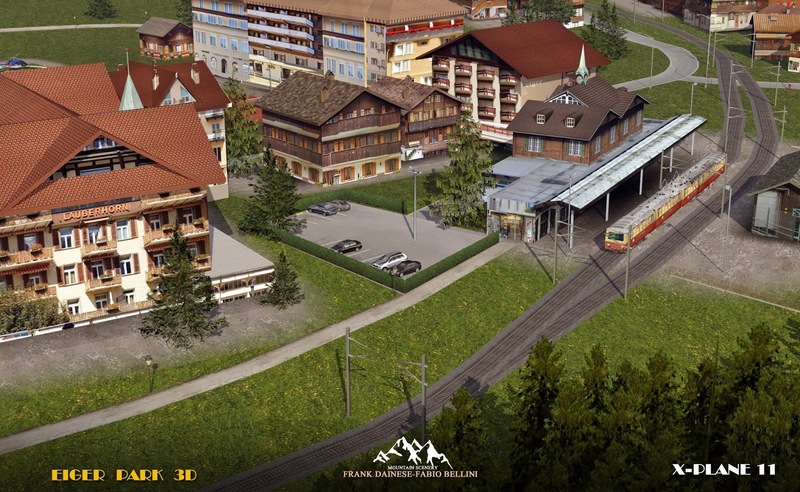 13 ski-lifts (cable cars / chair lifts) have been reproduced. 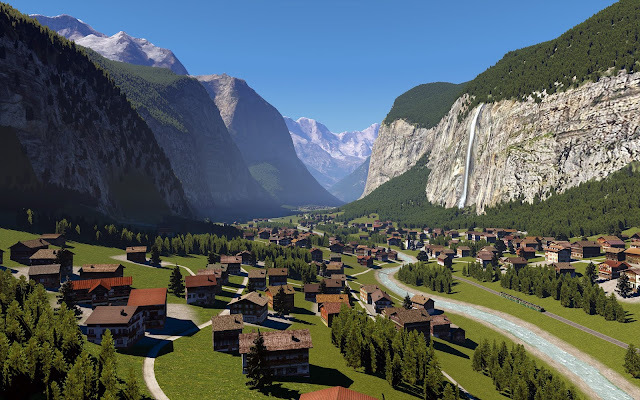 In addition to Grindelwald rebuilded Wengen, Lauterbrunnen with the famous waterfall over 400 meters, Stechelberg, Murren and its waterfall, Gimmelwald. nella bellissima Svizzera Alpina, comprenderà una zona di circa 500 kmq, con Eiger, Monch e Jungfrau. 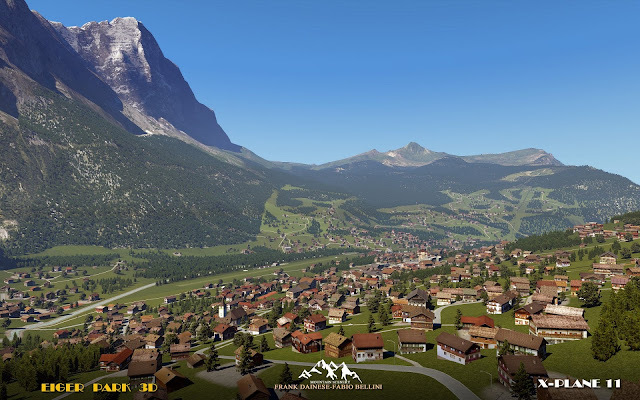 Le località alpine molto suggestive e caratteristiche di Kleine Scheidegg, Grindelwald, Wengen, Lauterbrunne, Murren, Gimmelwand...tutte ricostruite con case tipiche in 3D. 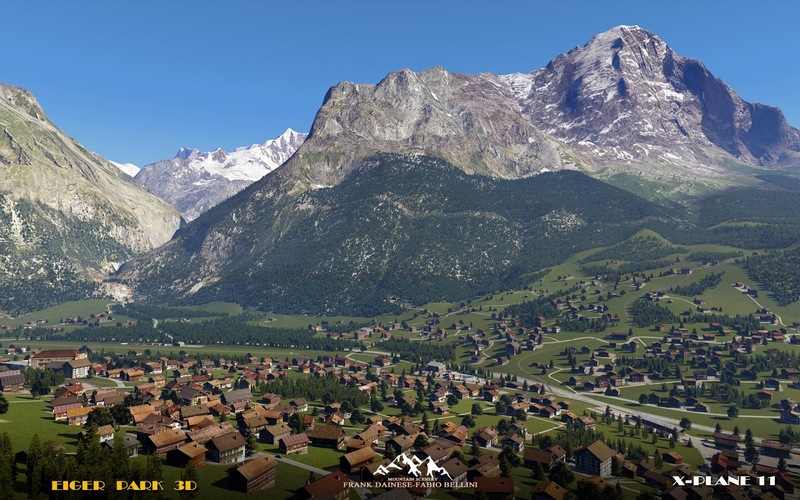 Protagonista la parete Nord dell'Eiger, una delle montagne più affascinanti delle Alpi, ricostruita in 3D in alta definizione. 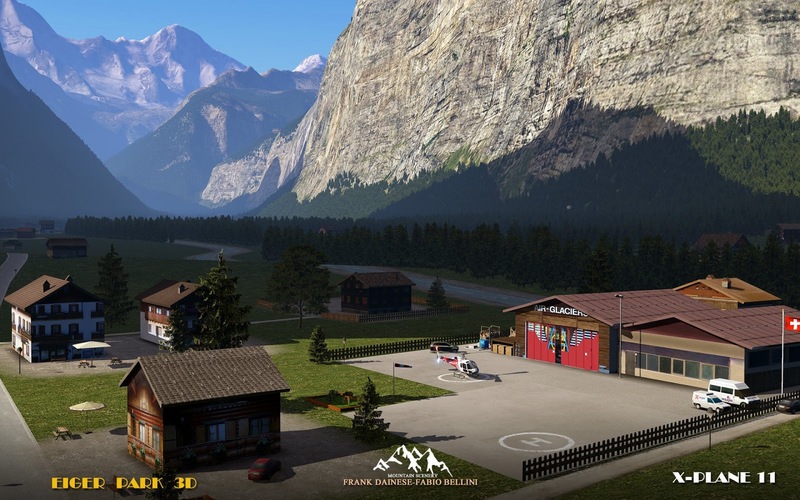 Una avio-superficie a Grindelwald con diversi eliporti nelle varie località. 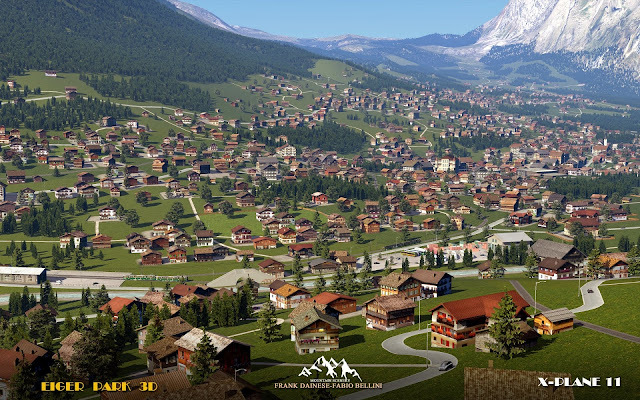 Fabio sta lavorando sodo a sistemare le mesh, quelle di base sono pessime e inoltre bisogna considerare che nello stresso grado, c'è lo scenario del matterhorn Park. 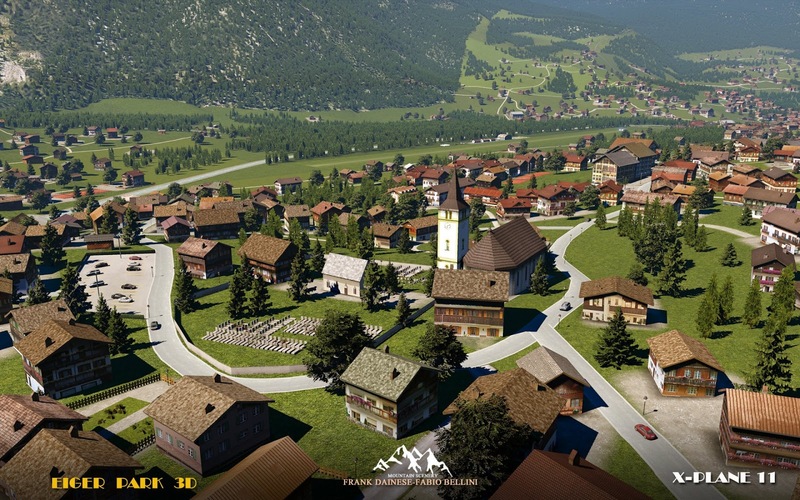 Prevediamo almeno 2 mesi di lavoro intenso. Le prime immagini della stazione di Kleine-Scheidegg. 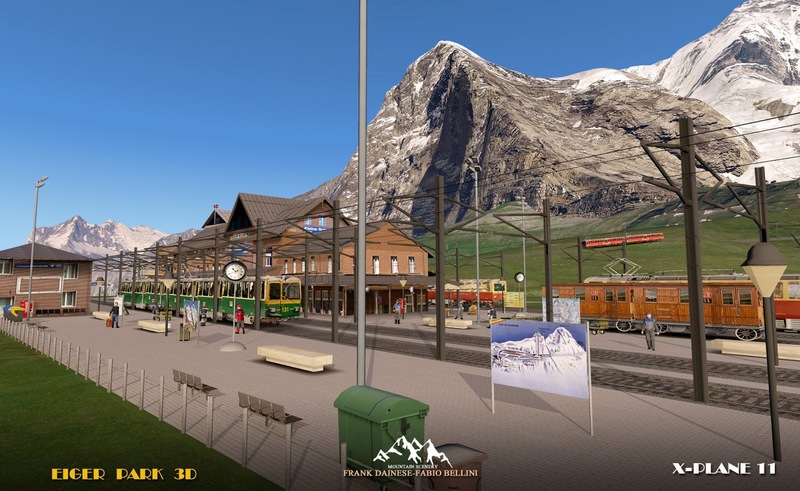 in the beautiful Alpine Switzerland, it will include an area of about 500 square kilometers, with Eiger, Monch and Jungfrau. 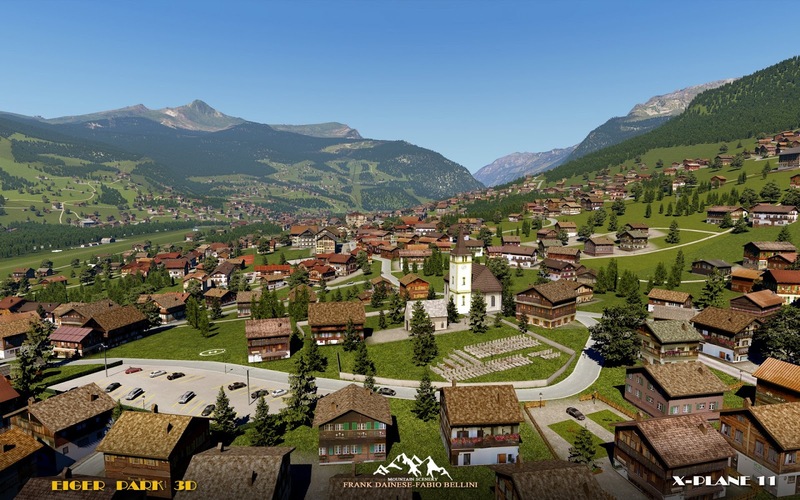 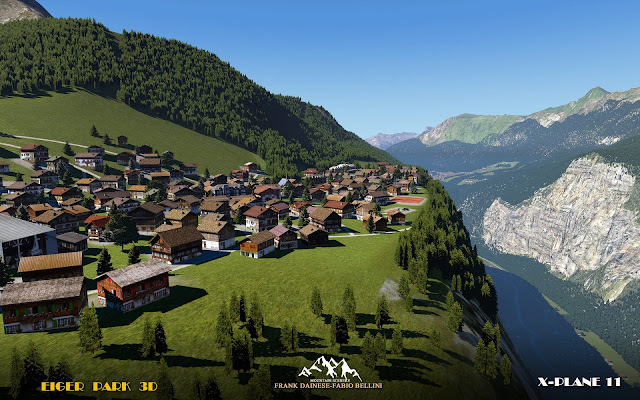 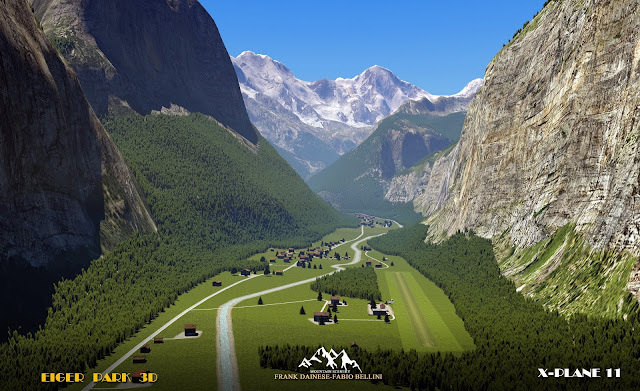 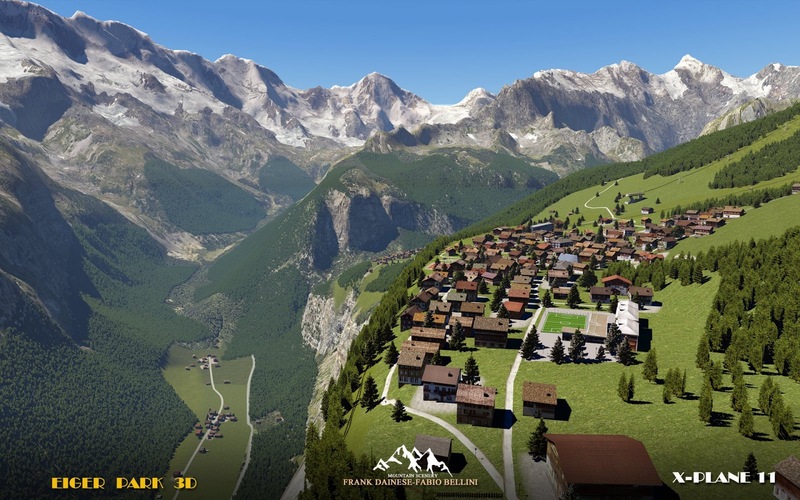 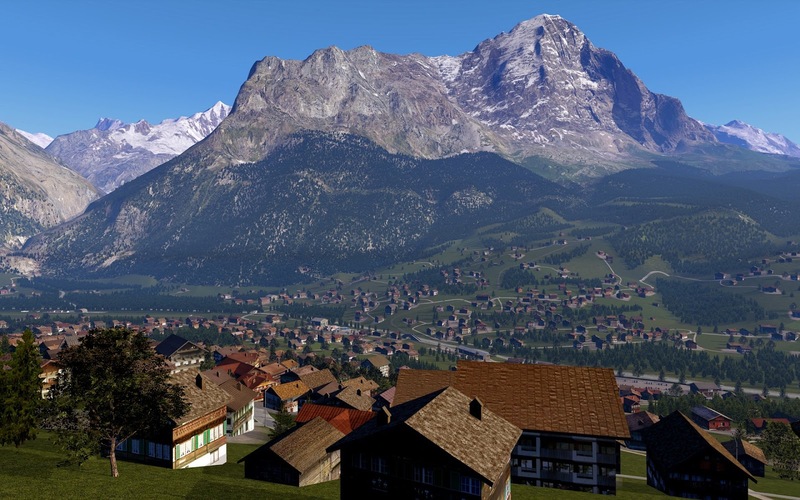 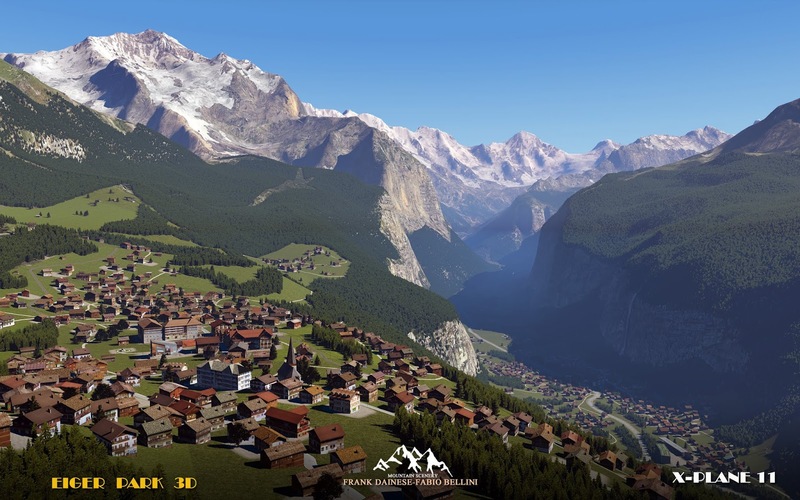 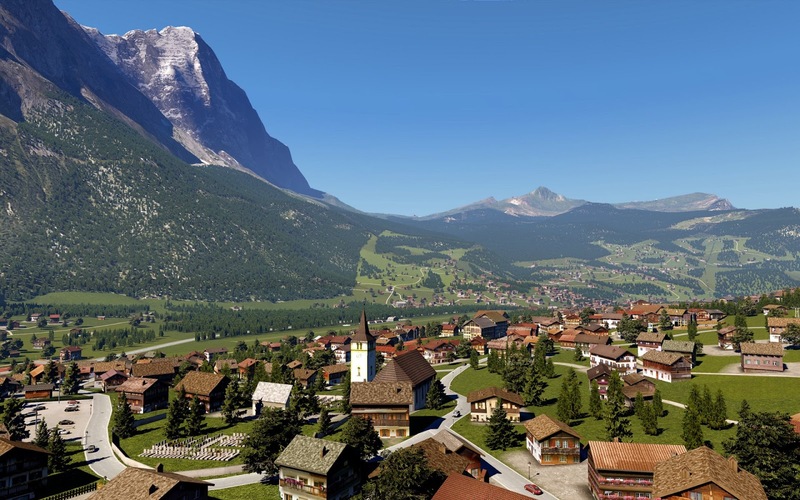 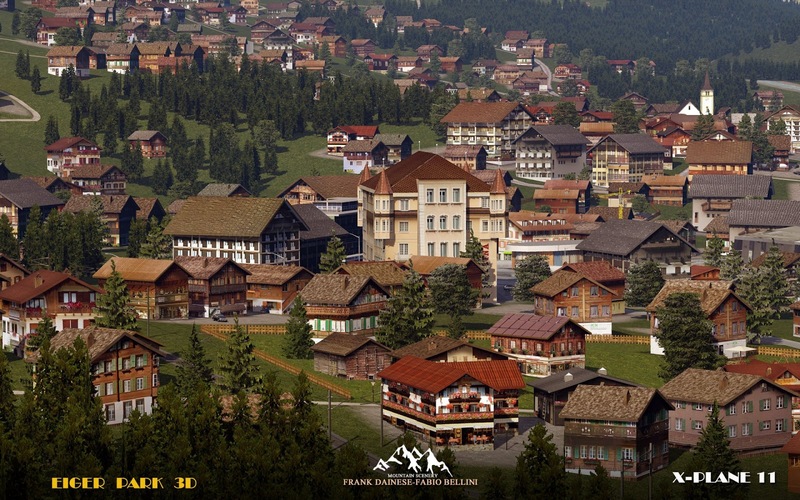 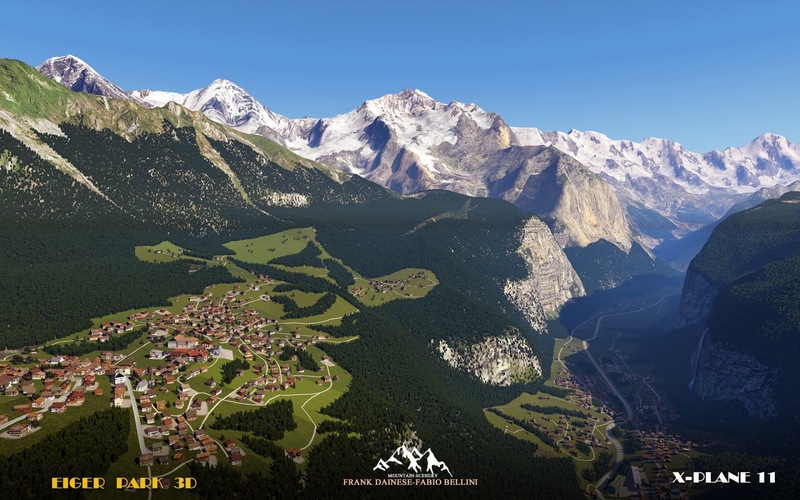 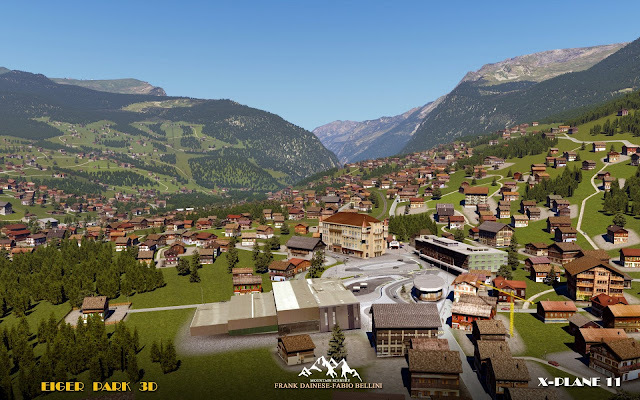 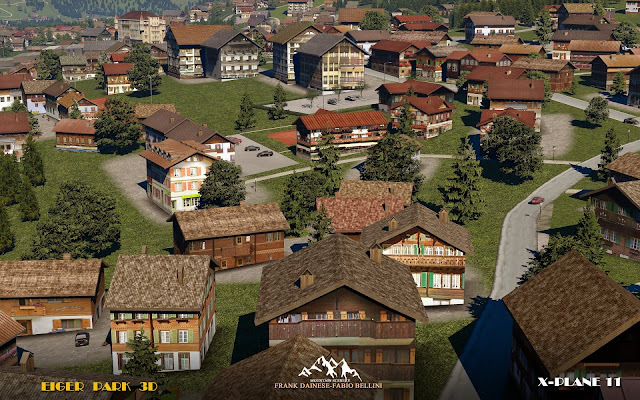 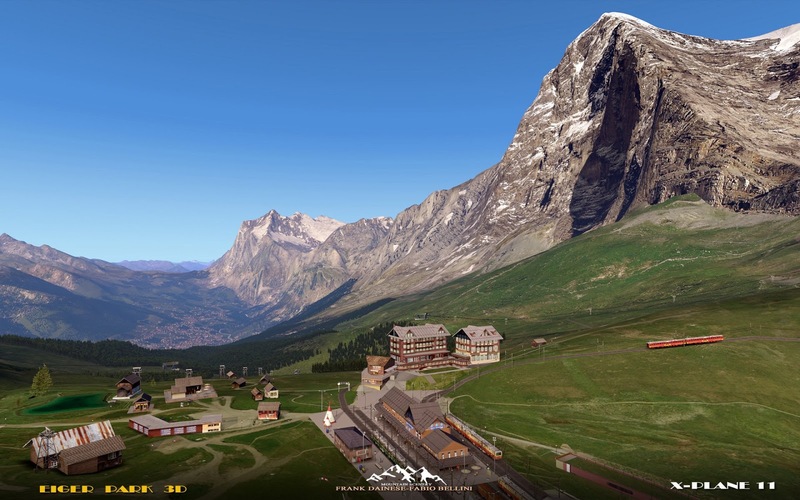 The very suggestive alpine areas and features of Kleine Scheidegg, Grindelwald, Wengen, Lauterbrunne, Murren, Gimmelwand ... all rebuilt with typical houses in 3D. 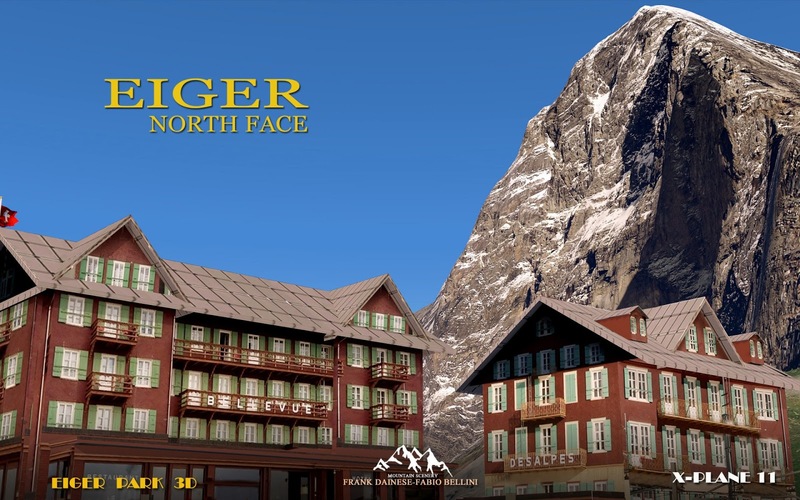 The scenery protagonist's Eiger North Face, one of the most fascinating mountains in the Alps, was reconstructed in 3D in high definition. 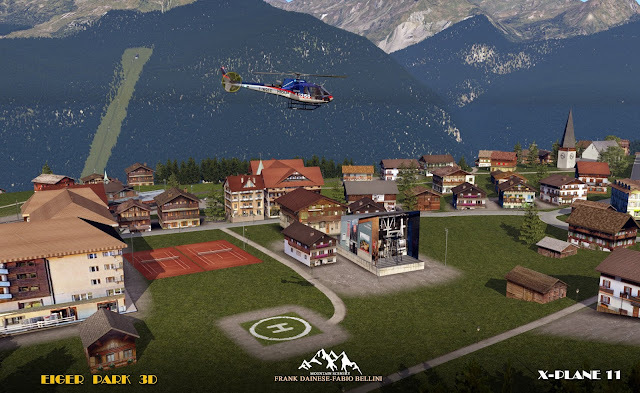 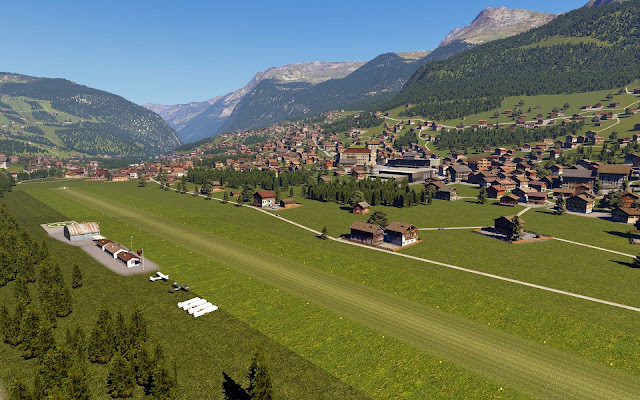 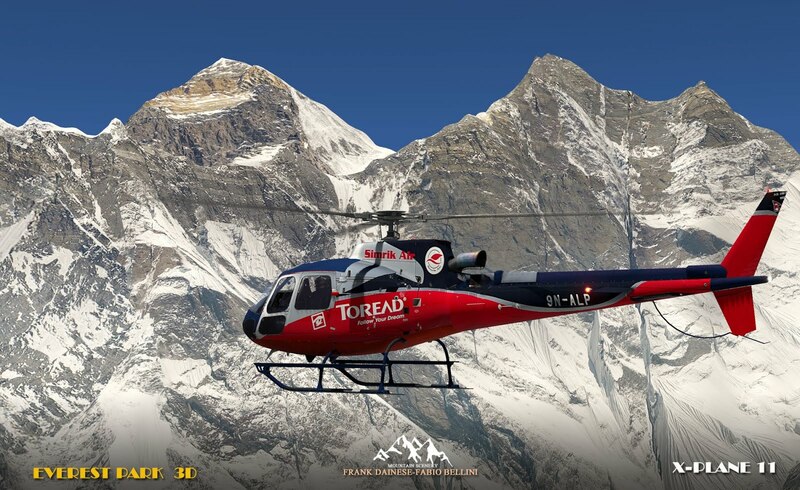 There will an field-airport in Grindelwald with several heliports in various locations. 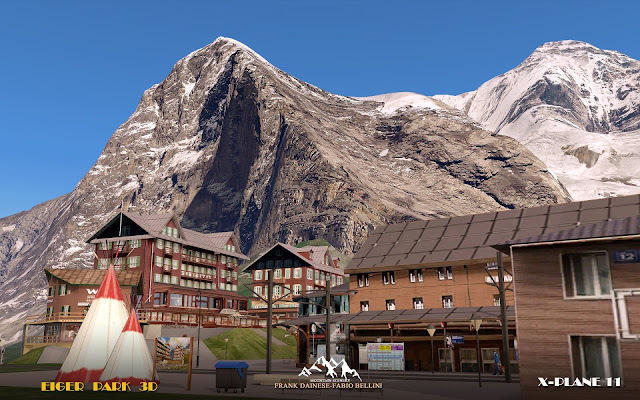 Fabio is working hard to arrange meshes, the basic ones are very bad and we must also consider that in the same degree, there is the matterhorn Park scenery. 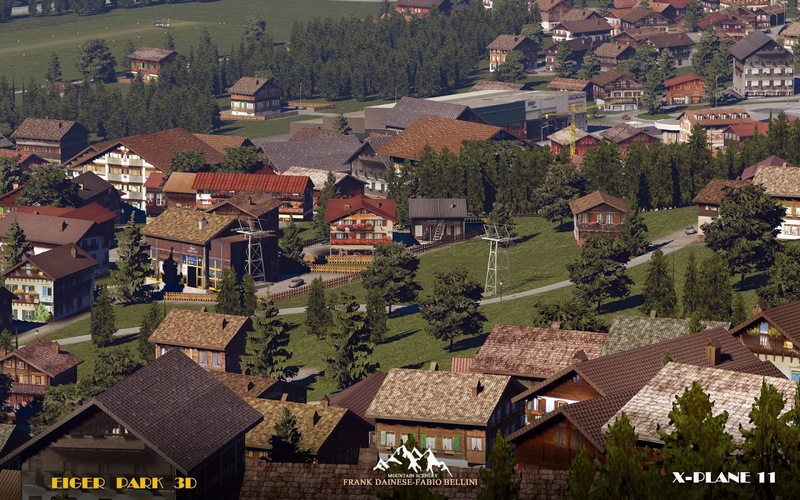 We expect at least 2 months of intense work. 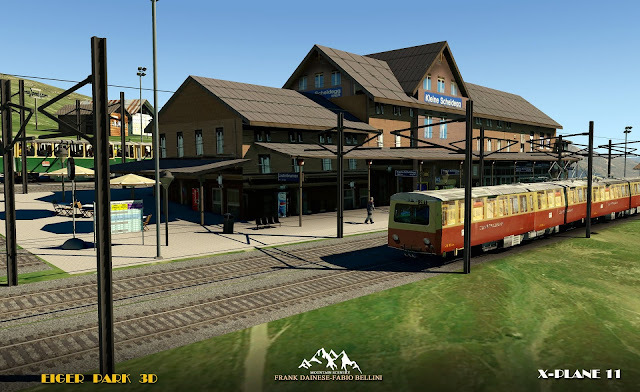 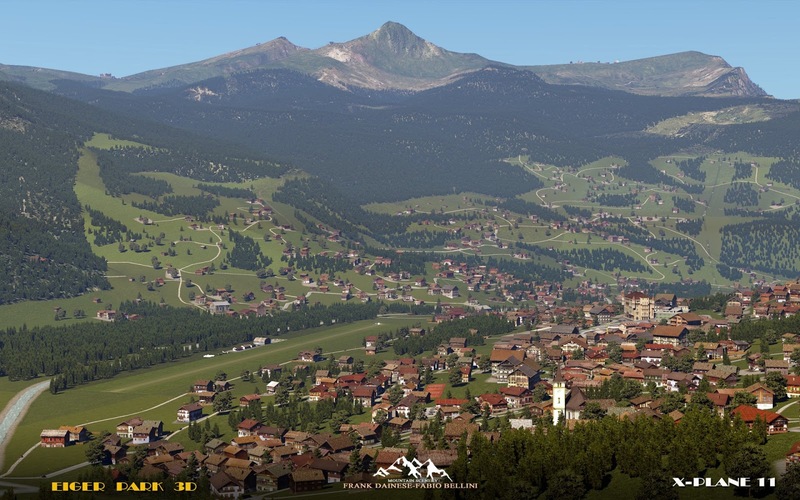 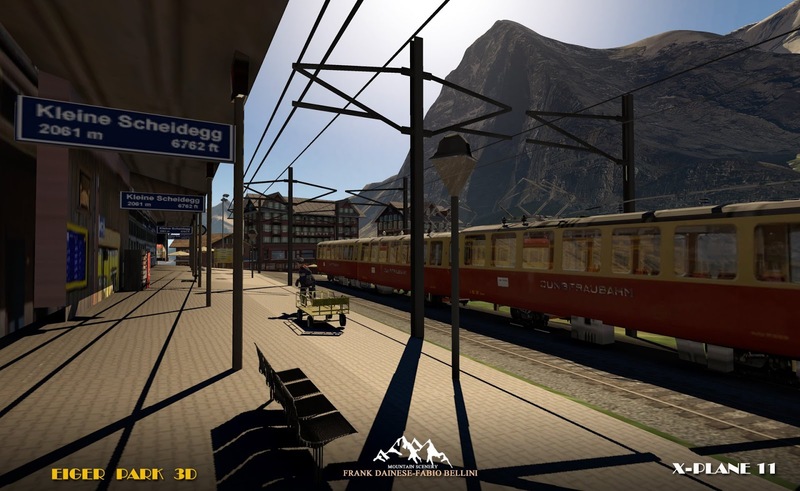 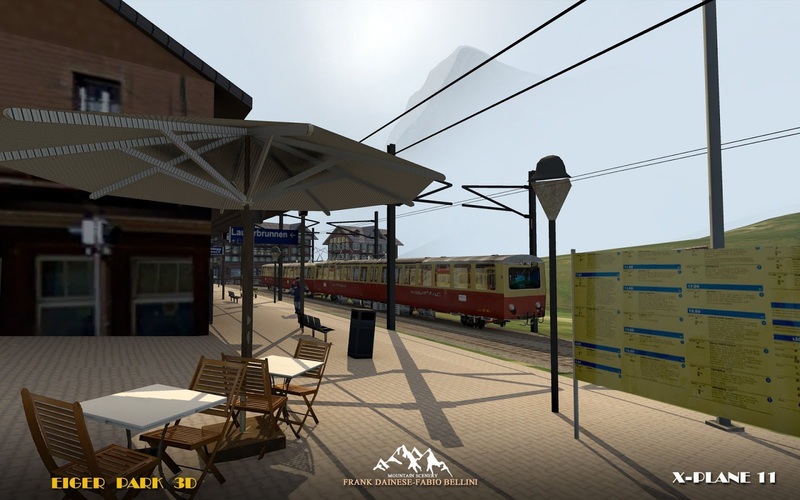 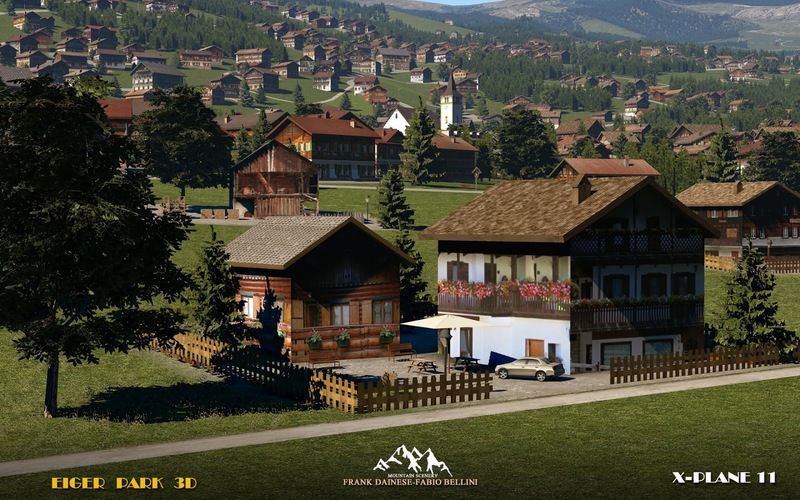 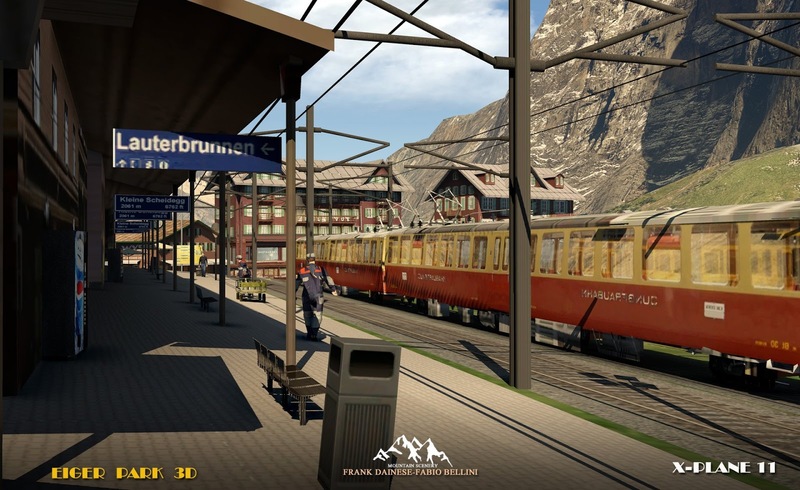 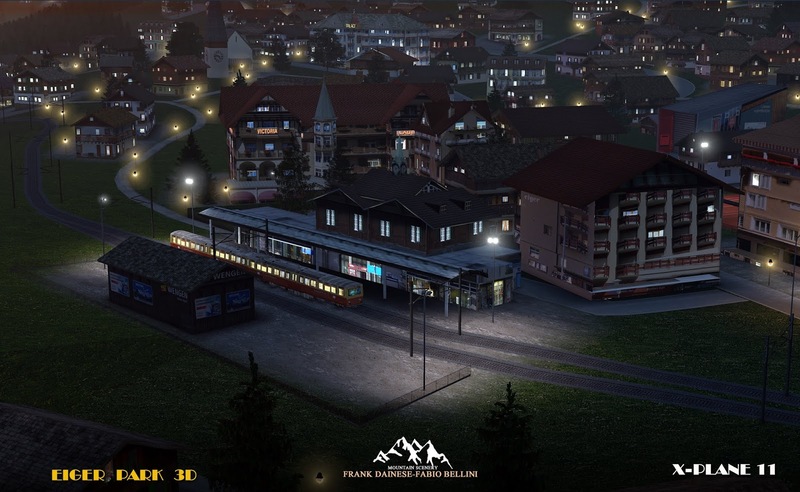 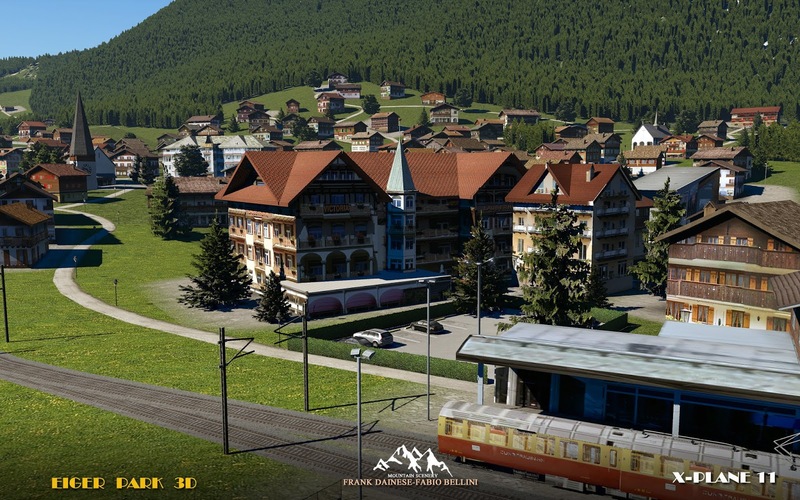 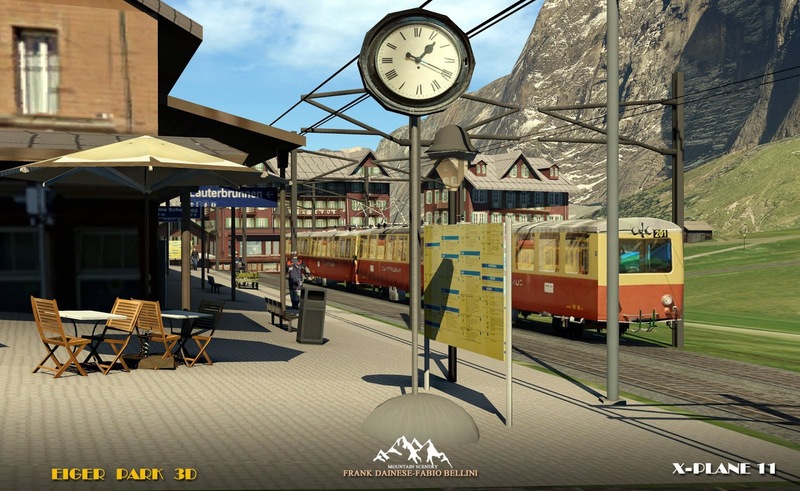 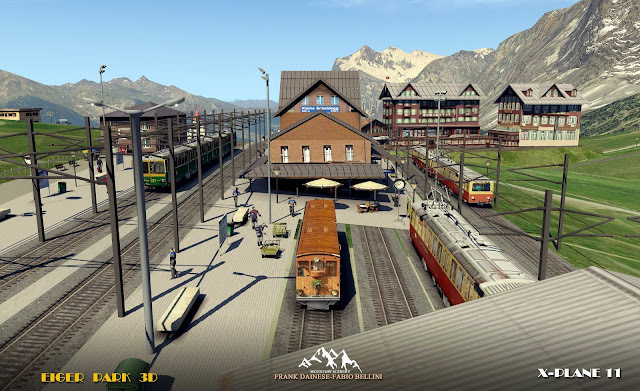 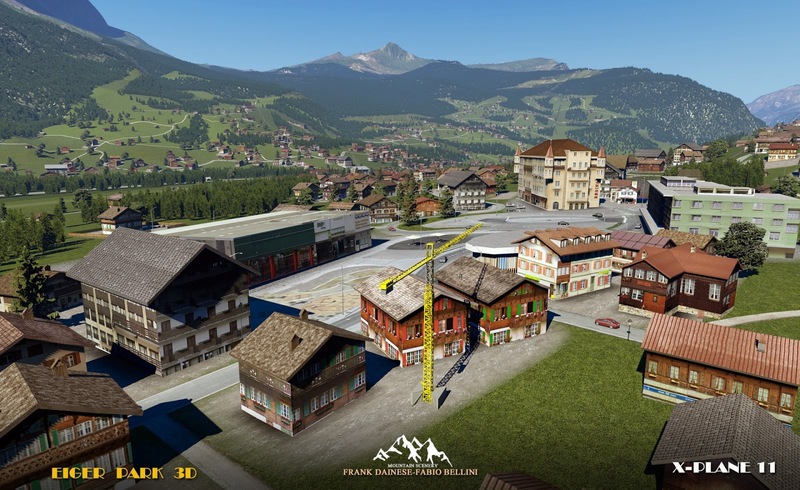 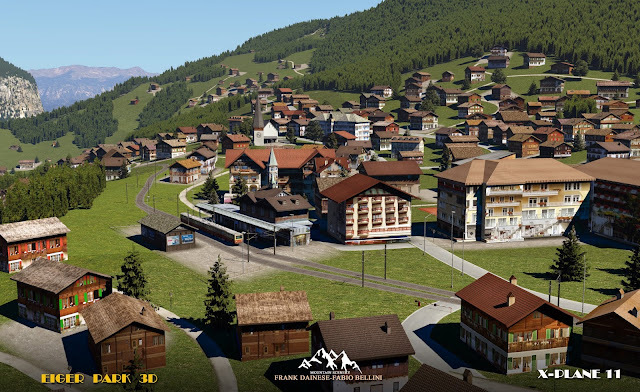 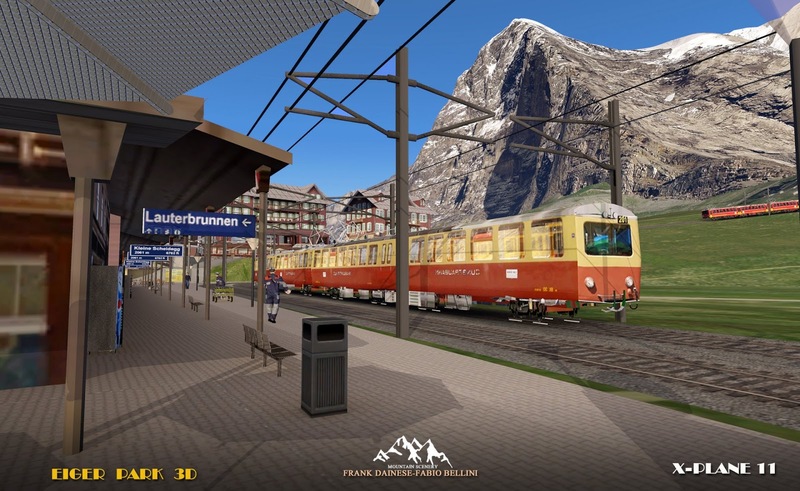 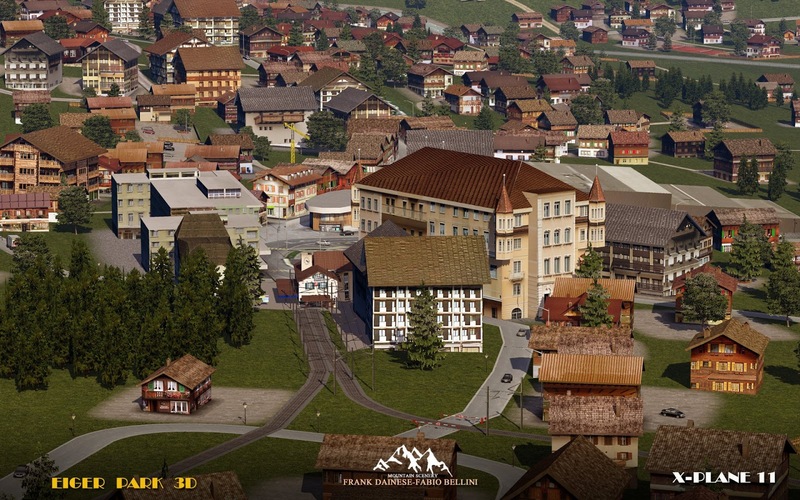 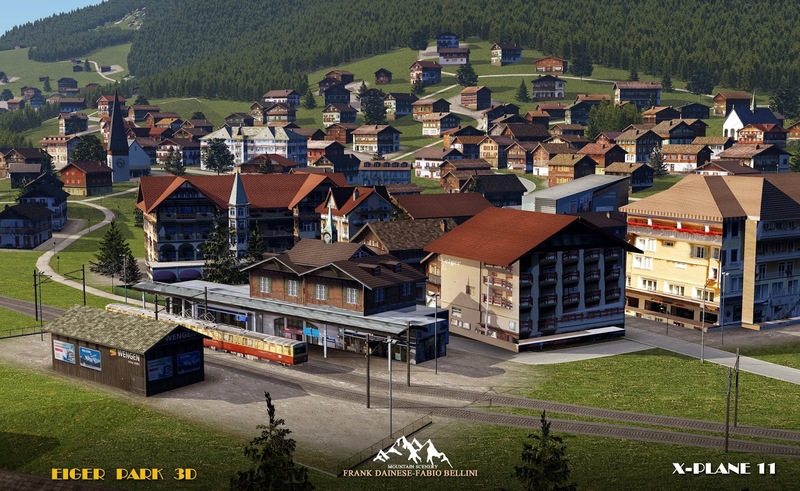 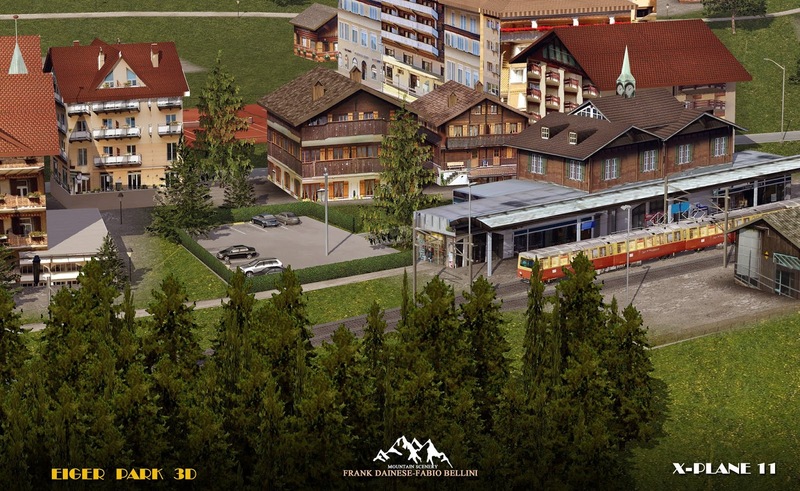 The first screenshots of Kleine-Scheidegg station.